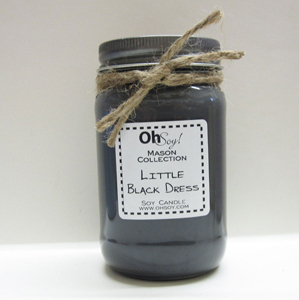 16oz Soy Mason Jar Candle in Little Black Dress scent. Little Black Dress Scent Description: Base notes of white carnation and blood orange are the blended with sandalwood, black rose, smoky wood, and a kiss of patchouli. The top notes give a hint of toasted vanilla bean and amber with a touch of Egyptian musk.